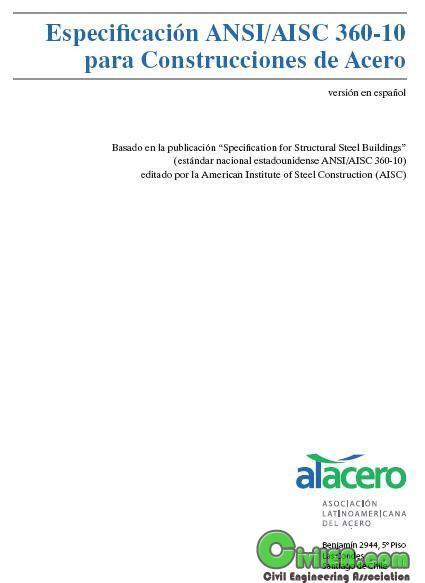 Civil Engineering Association - USA - AISC 360-10 for Steel Construction - Spanish version. Civil Engineering Association > eBooks > Codes, Manual & Handbook > Non-English written codes > USA - AISC 360-10 for Steel Construction - Spanish version. Full Version: USA - AISC 360-10 for Steel Construction - Spanish version. USA - ANSI/AISC 360-10 for Steel Construction - Spanish version. Based on the publication "Specification for Structural Steel Buildings" (American National Standard ANSI / AISC 360-10) published by the American Institute of Steel Construction (AISC). This specification establishes criteria for the design, fabrication and installation of structural steel buildings and other structures where other structures are defined as those structures designed, manufactured and assembled in a similar way to the building, thus indicating that its resistant elements vertical and lateral loads are similar to those resistant building systems. If this specification refers to the applicable building code, and the code does not exist, loads, load combinations, system limitations, and general design requirements are set out in ASCE / SEI 7. When these conditions are not covered by this specification, allowing the design is made based on tests or analyzes, provided they are approved by the competent authority. The use of alternative methods of analysis and design, to the extent that such methods are accepted by the competent authority are allowed. Seismic Applications: The code Seismic Provisions for Structural Steel Buildings (ANSI-AISC 341) should be applied in the design of earthquake resistant systems structural steel or structural steel acting in combination with concrete, unless specifically exempted by the applicable building code. The provisions of Annex 1 of this specification should not be applied to the seismic design of buildings or other structures. Nuclear Applications: In addition to the provisions of this specification, the design, manufacture and assembly of nuclear structures must meet the requirements of Safety-related Specification for Steel Structures for Nuclear Facilities (AISC ANSI-N690). The design is made in accordance with the provisions of the design method based on factors Load and Resistance (LRFD) or any method based Design Allowable Resistance (ASD).